Ramble on with the instructions like you’ve done it all your life? Have you ever called tech support and had to call time out because they told you to copy that, type this and insert it there and you had no idea what they were saying? I don’t speak techno geek, do you? “All your DIY ideas are great. And I love Pinterest for that as well, but like you said, time is one of the big issues and with me I have to add the word “talent”, “eye for it”, etc. I don’t have what it takes. I sometimes have ideas but I don’t have the time, money, know-how, energy, etc. to actually do it. I guess I’ve started too many projects and not finished them because of these factors. Also, I have the fear of it not turning out and then that money is wasted. I tried something from off Pinterest last year and spent $X amount of money. I spent hours/days on this trying to make it work. There was something missing in the instructions or in my interpretation of the instructions and I couldn’t figure out what needed to be done to fix it. Lots of money wasted. 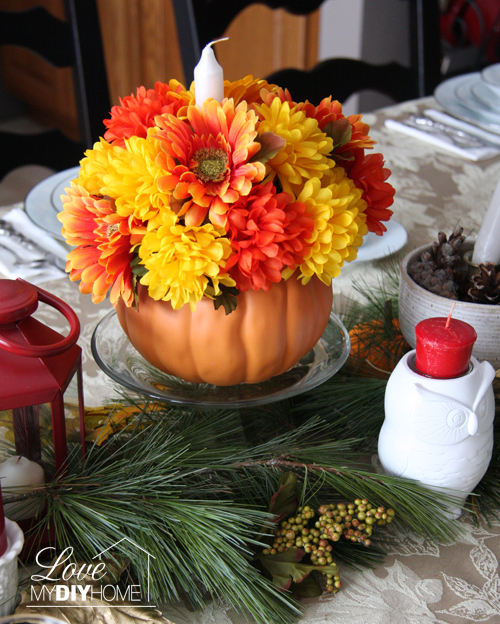 I have the 4th tip on fall tablescaping for you. Vary the height of your decorations. Yep. Vary the height for visual appeal and then layer. 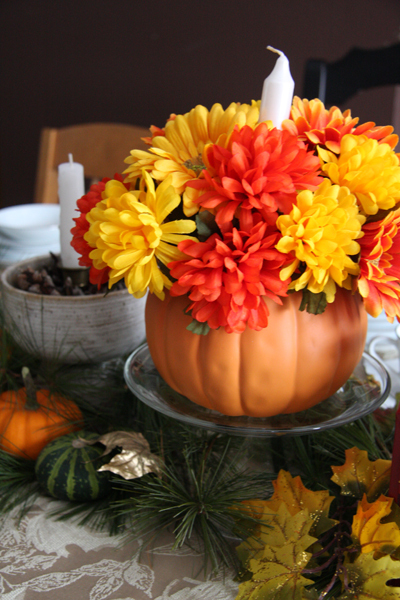 Do you look at the tablescapes on Pinterest and wish you could do that? Use colorful items as accents. Add items from the great outdoors. Use candles. Lots of candles. Get creative and use different colors, textures and shapes. Add a little silver or gold spray paint for some glam. 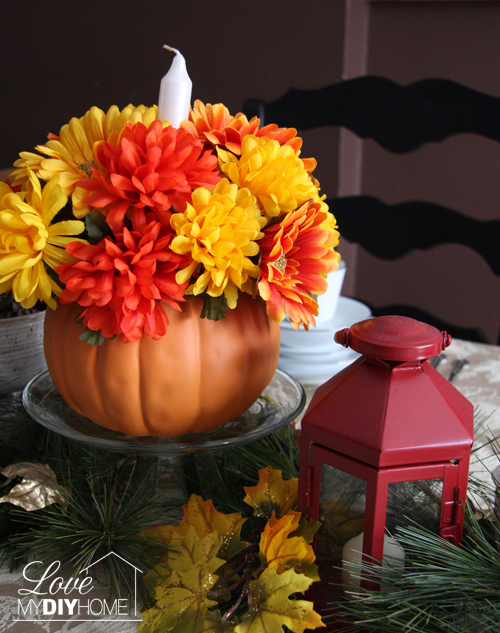 I used my ceramic pumpkin flower arrangement (see tutorial here) for the centerpiece and my painted lantern. I decorated out from there adding this and that until I liked what I saw. 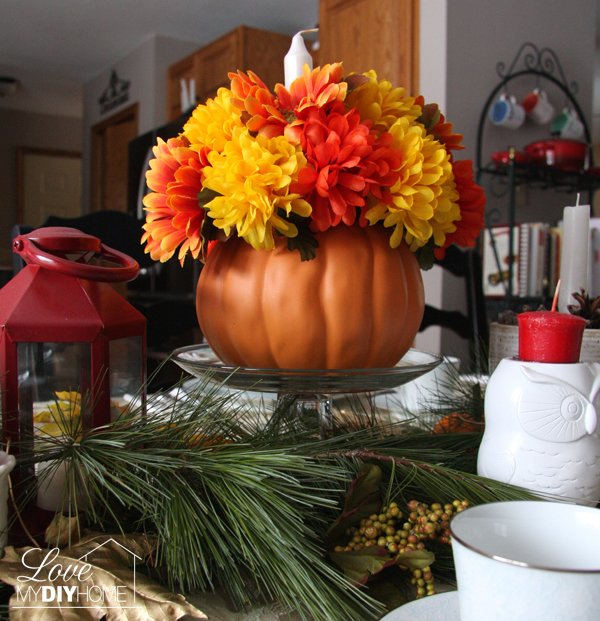 Grab your bowls, candle holders, boxes, pedestal cake plates and vary the heights all along the center of your table, picking different items to place beside, under, on top of, etc. 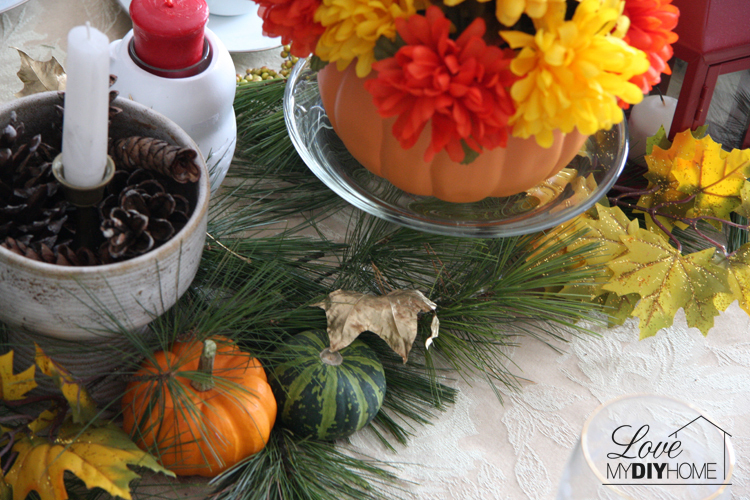 Then fill in with your greenery and other organic materials like pine cones and leaves. 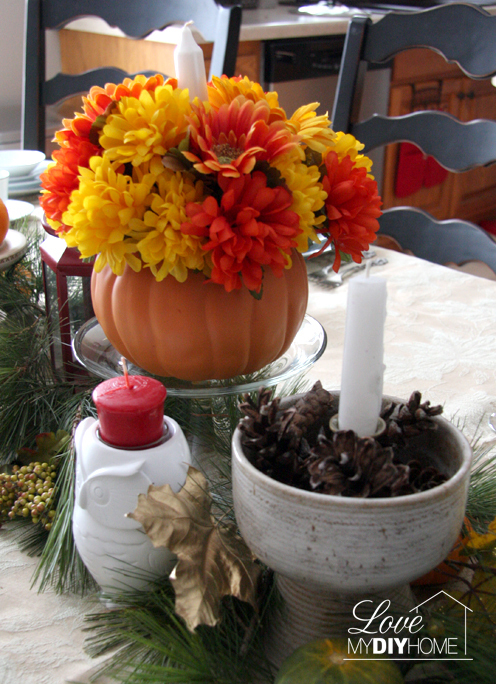 It is OK to use some silk flowers and leaves to fill in with the outdoor materials. Mix and match. Get creative! As always, if you have any questions, comments or just want to say, “Hey,” please leave a comment or email me. I would love to see you succeed and have some fun DIY’ing. 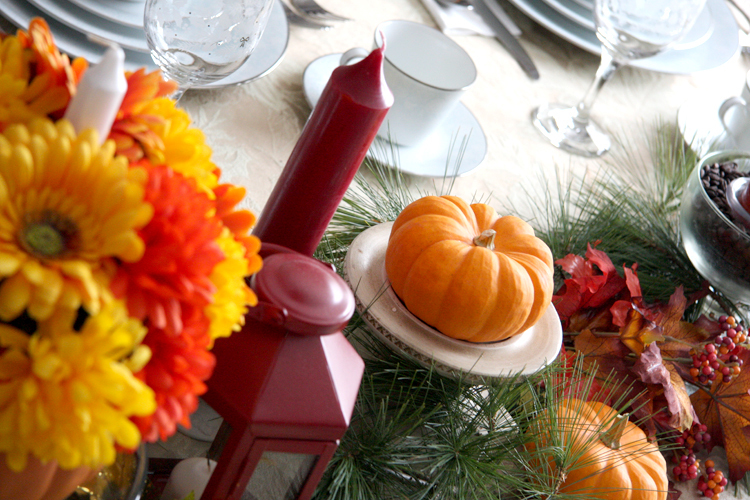 Start now planning your Thanksgiving tablescape. Your table is beautiful, Val! I love the concept of varying heights. What an easy, but very effective way to add interest to a gorgeous design. With the varied textures, colors, heights, and materials, it has lots of interest and begs for more than a glance. I'm loving this series and can't wait for more. And glad to hear I'm not the only one who doesn't speak "their" language! 🙂 I'm glad you got things fixed. Thanks, Karen. It’s so stressful to have a messed up site! Thanks for the cuddos. Don’t you just love the fall colors? Sometimes when someone talks about something they are very familiar with they forget not everyone else in the world is. We tend to feel stupid, but really, it’s just that we are unfamiliar. 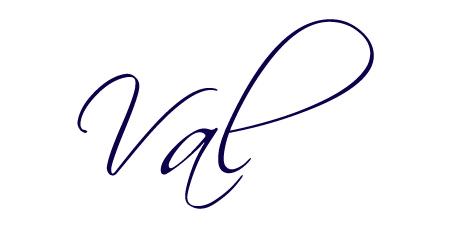 We ought not to let it intimidate us – we just need to realize not everyone is an expert in every area. Intelligence has nothing to do with it. I love the colors and the fact that you used items you already had. 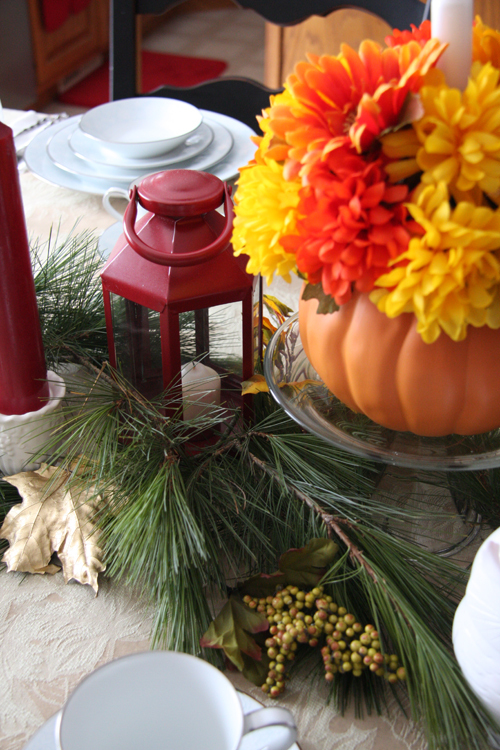 It's time to spiff up my fall tablescape and you have inspired me! I’m thinkin’ we all need to use what we have much more than we do – less wasting of money and resources. It just takes a little imagination. Visiting from Project Pin It! Thanks, Natashalh, we have had such a beautiful fall here. My son was stationed in Hawaii and stayed after his tour was up. I hope you are enjoying your time there! I've had issue with my site too, glad you got it back up and running. 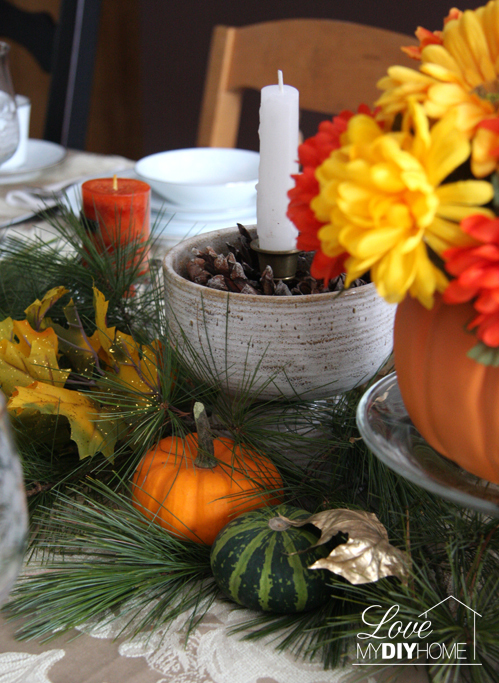 Great tips on making a nice tablescape. Thanks for sharing on Merry Monday. Thanks, Erlene. Electronics can be a blessing and a curse at times. Thanks for stopping by. Oh Jennifer, you can do this! All it takes is a little time and planning. Go out to stores and see what’s being clearanced and on sale, grab what you like and play with it – It so fun! Thanks, Kathy. I appreciate your hosting the linky. Thanks for stopping by.